To escape the bickering, and whining, and needs and desires and everyone’s demands, I took our dog for a walk on a quiet fire trail near our house. Bright and beautiful out, a sweet sea breeze came over the Oakland Hills with the afternoon sun. The mile and a half dirt path cut along the base of the foothills was mostly vacant, rarely used by even residents of the neighborhood, so I did not leash my dog for the walk. I saw someone from the ridge while I waited for the dog to finish marking her territory in the open field atop the hill. A woman was coming towards us on the trail below, and I tensed as I scanned for the dog she was most likely walking, but saw none. Still, I called my 70 pound Shepherd-mix to me. My beautiful pound hound was passionately in love with people, but most didn’t appreciate her bounding up to greet them. My dog came to me and I held her collar as we stood on the ridge and watched the woman trudge up the hill; her white hair looked almost like a silver helmet in the sunlight. She walked slowly, and carefully, and hunched. I made her out to be in her mid-70s. The dog started whining the moment she noticed the woman approaching, pulled to get away from me and go meet her potential new friend. The woman was 30 feet away when she noticed us, looked up and stopped. I loudly assured her my dog was VERY friendly and loved everybody, that I held her securely, asserting there was no need to worry. The old woman looked at my dog wagging her tail wildly and whining incessantly, and she smiled. She confidently told me she loved dogs and then called mine to her. I let go of my dog’s collar and joined the woman on the path where she stood stroking my hound. She gently ran her hand along the length of my dog’s back again and again while extolling the animal’s Sphinx-like appearance and friendly nature. Dog was mesmerized with her touch, as she was with just about anybody’s, but the old woman seemed to really enjoy the contact as well, her expression set in a soft, contented smile. She explained she’d had several dogs during the years she and her husband raised their three kids. The dogs had passed on, the kids had moved on, now with families of their own. Her husband died two years back and for the first time in all her life she was alone. Her kids, even her grandkids kept telling her to get a dog. I chimed in with words of encouragement, told her about getting my dog at eight weeks old from a kill shelter in Manteca, and ranted about some great local shelters where she could rescue a dog. Dog came bouncing back, long tongue dangling from panting (grinning?) mouth. She came up to me first to get my pat then went back to the old woman for more strokes, which the woman gave willingly. “I’ve been on three cruises in the last two years. 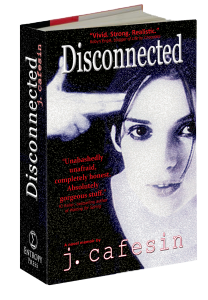 I play canasta twice a month, and see all the new movies I want.” Again she seemed…pacified, by patting the dog. “Turns out, the good life was when I was needed. Being counted on made me feel vital, and valued. Now, no matter what I do, I mostly just feel lonely.” She straightened and brushed her pant legs off again as my dog swaggered over to the tall grass and lay in it. “I think you all may be right and it’s time I got a dog.” She gave me a pleasant smile. “It’s been a pleasure chatting. Good day to you.” And she went on her way. My dog trotted after her a few steps then came after me as I started home in the opposite direction. I stroked her as she walked by my side, glad to have her with me, counting on me, as my kids and my husband did, and probably would for many years to come. I imagined the old woman’s empty house and anticipated the tumult in mine. And suddenly I felt very lucky indeed to be living the good life. 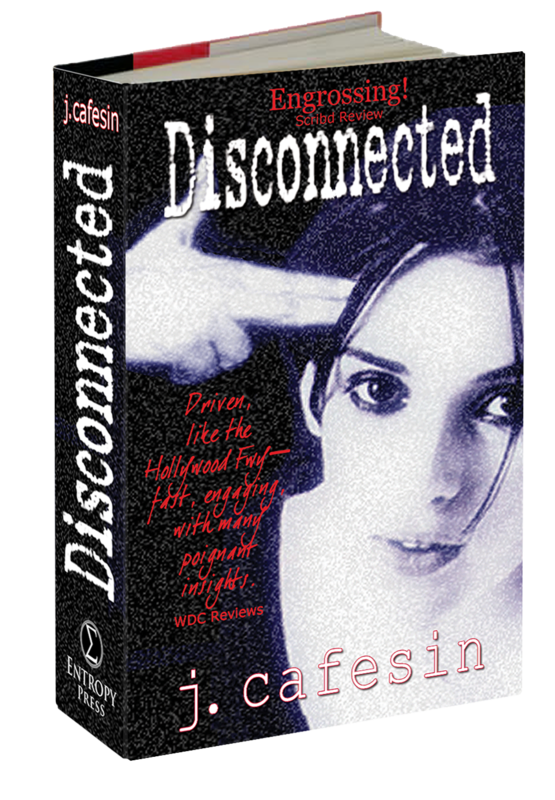 Disconnected reads like a modern Jane Austen—taut, smart, historical lit chronicling the coming of age for the last of the baby boomers with the displacement of classic gender roles at the end of the 20th century. Rachel and Lee’s tumultuous relationship is reflected in the land of perpetual sunshine imploding with rapid growth, racial tension and violence. 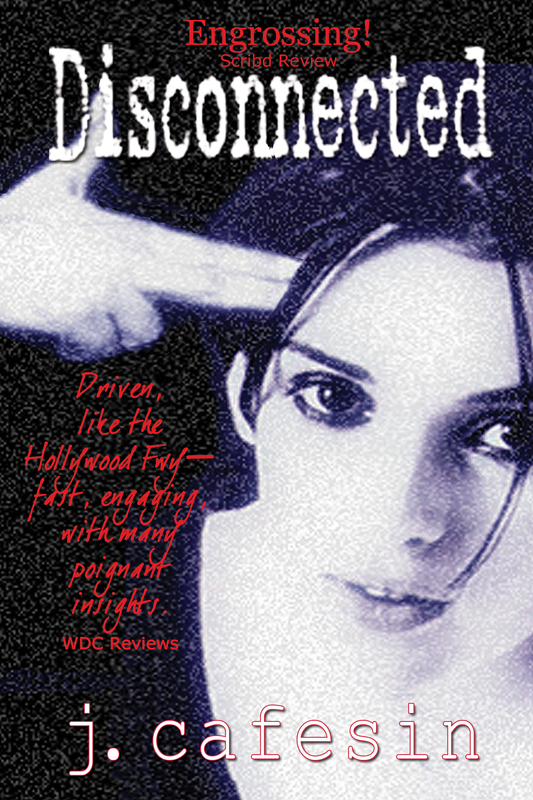 Disconnected is an L.A. story, an addicting contemporary romance, and like the city itself embodies a very sharp edge. Please leave a comment if interested and I’ll get back to you! Ever fall for someone you knew you shouldn’t? Ever drank too much, ate too much, indulge in excess? Are you living the Good Life? What is your idea of the good life? Are you living it now?